If a student isn’t going the military, technical school, or community college route, then I would suggest that now is a good time to plan for upcoming college costs. 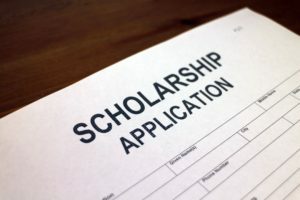 Whether we are using scholarships, loans, or financial aid, there’s typically money hiding somewhere, if we look hard enough. Higher learning expenses go far beyond tuition and books…it also includes rent, food, and travel. These extras quickly take $9,000 in total expenses per year and turn them into $25,000. Thankfully, 67% of students receive some sort of financial aid, approximately 60% of those recipients received aid in the form of grants and 40% in the form of Federal loans. In this process, schools will want to know a family’s financial picture. If the family qualified then they will receive preferential loan interest rates, grants, and subsidized programs. Below, I’ll explain what information schools need, how they use that data to determine aid and helpful strategies to increase a family’s chances of qualifying. FAFSA or CSS? Wait… What’s CSS? new app further simplifies the process. The FAFSA looks at the parent and student income and assets. Schools expect students and parents to contribute different percentages of their assets towards school costs. Assets held in the student name are weighted 20%-25% whereas parents assets are only weighted 5%-5.64%. Parents are also expected to contribute 22%-47% of their net income towards college costs every year while students must contribute 50% of their eligible income. However, because FAFSA is an incomplete view of a family’s real financial strength, more competitive schools are requiring students to complete a CSS Profile. Think of the CSS profile as providing very little wiggle room in terms of hiding assets. Schools in NC that require the CSS profile are Chapel Hill, Duke, Davidson, and Wake Forest. A full list of schools that require the CSS profile can be found HERE. 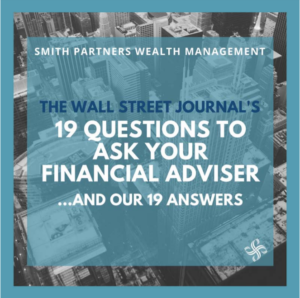 The CSS looks at all of the FAFSA data, but will also take into account multiple years of income vs. one year, business assets, life insurance, trusts, and annuities. What Does Prior-Prior Income Mean? Under the new Prior-Prior rule (as opposed to the old single prior rule) schools need to know income from two years before the year classes begin. So if a student who is a senior this coming Spring (2019) is applying for their first year of college in 2020-2021 and submitting their FAFSA in October, then they will use their parents’ 2018 tax returns. Sadly, assets do not look back two years where they may have had lower market values. Asset values are current and therefore malleable until CSS and FAFSA completion. Because it’s a present value, strategies are easier to implement today, for a lower market value of some assets. This lower value may be due to a minority share in a business, no voting rights, expected returns were lower, etc. Which Assets Count Against Me? Retirement accounts such as 401k, 401a, 403b, 457b SEP IRA, SIMPLE IRA, Pensions, Roth IRAs, and IRAs are all exempt from the EFC calculation. Assets in checking accounts, CD’s, brokerage assets, money market accounts, investment real estate (unless it’s in an LLC and taxed/titled as a business, in which case it may qualify as a small business which will avoid FAFSA but not the CSS profile), stocks, bonds, mutual funds, and 529 college savings and prepaid plans are included in the EFC calculation. Regardless of current access to a trust fund, a trust fund will count towards a family’s EFC. Colleges do allow an emergency fund of $15,000 – $25,000. This allowance, thankfully, isn’t part of the asset total. On FAFSA small business assets, life insurance cash value, home equity and non-qualified annuities aren’t counted but on the CSS profile, they are. EFC calculations don’t count Grandparents 529 assets. However, if they make a distribution to cover college costs from their 529 accounts, it will count against next year’s aid. FAFSA/CSS will see their 529 distribution as a gift and count it as the students’ income next year. So it may be best for Grandparents to wait until the last year to pay for school rather than trickling a little out every year. A family’s EFC is the key number that both the CSS and the FAFSA are meant to attain. Financial aid awards are based entirely on incoming students’ EFC (Cost of Attendance – EFC = Financial Need). Cost of attendance is school specific and will include tuition, fees, rooming, books, and travel expenses. For easy math, most four year public schools are around $30,000 annually. It’s hard to say what a families’ EFC will be at a glance. But the table below does a great job of estimating EFC with limited variables. One column specifies income, and the other is dependents. The income used for this chart should be prior-prior income (more on that below.) 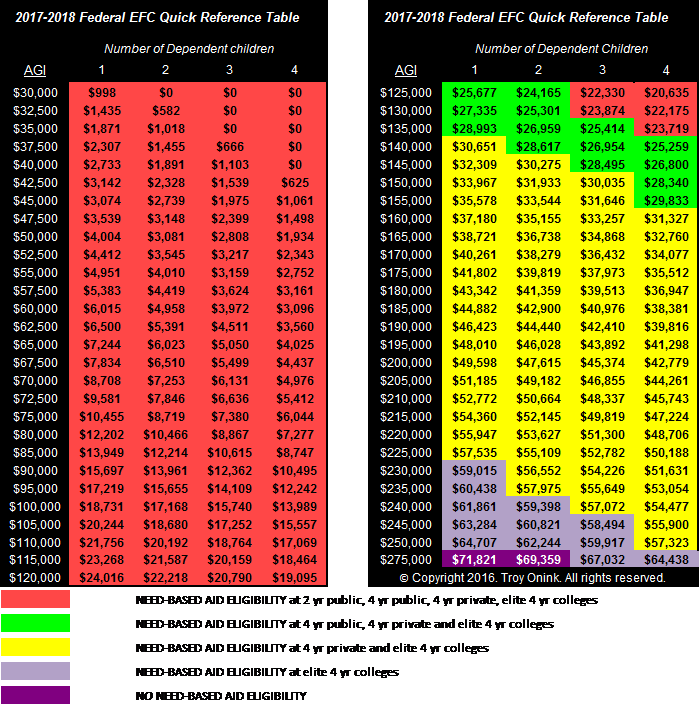 The number shown in color is a family’s EFC estimate, and as long as there is a color next to AGI, then this table assumes a FAFSA application will qualify for some amount of aid depending on the cost of attendance. Strategies for Maximizing Financial Aid. Shrink income, in counted years. The success of these strategies correlates directly to your situation in regards to income, the number of kids in college, employer, assets and college costs. Asset structure can also be changed to increase your benefit. You should have assets in the parents’ names instead of the child. Spend the students’ assets first. Make a large purchase you were going to make anyway such as a boat, car or primary home. Home equity has a cap of 2x-3x salary in the CSS profile. This will transfer assets from counted to uncounted. For FAFSA but not for the CSS profile some Life insurance and Annuities may help remove assets but be sure you know what school you are trying to qualify for before taking on this strategy. The reason to be cautious is it will be irrelevant for certain schools, is illiquid and has fairly high fees. Place and re-title investment real estate in an LLC so that it can be seen as a separate business entity (this only works for FAFSA, not CSS). Pay off debt (mortgage, car, credit card, student loans, etc) you could pay off your home and qualify for a home equity line of credit (HELOC) to cover emergency expenses. Parents can also go back to school to further their education. An extra family member in college would increase overall costs but lower EFC which would make sense if they were planning on furthering their education at regardless. The best solution to this problem removes worries about FAFSA, the CSS profile, and how rules will change throughout the years. That is by planning and saving before a child’s first birthday if possible. Remember that 9.99 times out of 10, informed decisions are better than uninformed decisions. So don’t avoid the situation, see it for what it is and communicate with those involved. Don’t forget to talk with your kids about college costs and what they should expect. If they will be on their own, then it’s worth finding someone to teach them the repercussions of their actions before they draw $100,000 in student loans. Best of luck applying to colleges and hopefully finding aid along the way. If you have any further questions then feel free to email or call us.